SURREY, BC – Ongoing demand for properties in the Fraser Valley saw overall sales reach the second highest point for an October in the Board’s history. The Fraser Valley Real Estate Board processed 1,799 sales of all property types on its Multiple Listing Service® (MLS®) in October, an increase of 23 per cent compared to the 1,463 sales in October of last year, and an 11.1 per cent increase compared to the 1,619 sales in September 2017. Attached sales represented 56% of all market activity for the month, with apartment sales totaling 591 and townhomes at 418. Last month the total active inventory for the Fraser Valley was 5,483 listings. Active inventory decreased by 6.3 per cent month-over-month, and decreased 9.1 per cent when compared to October 2016. The Board received 2,479 new listings in October, a 13 per cent decrease from September 2017, and a 12.8 per cent increase compared to October 2016’s 2,197 new listings. For the Fraser Valley region the average number of days to sell an apartment in October was 18 days, and 19 days for townhomes. Single family detached homes remained on market for an average of 31 days before selling. Single Family Detached: At $971,900, the Benchmark price for a single family detached home in the Valley decreased 0.3 per cent compared to September 2017, and increased 11.8 per cent compared to October 2016. Townhomes: At $502,800 the Benchmark price for a townhome in the Fraser Valley increased 0.8 per cent compared to September 2017, and increased 18.4 per cent compared to October 2016. 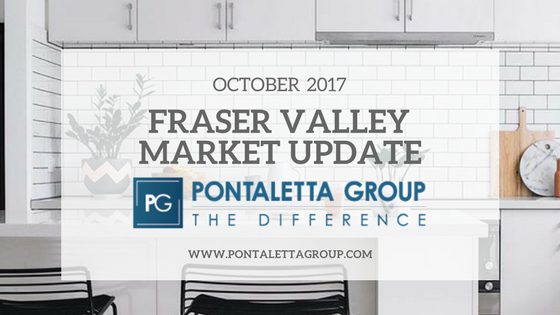 Apartments: At $369,400, the Benchmark price for apartments/condos in the Fraser Valley increased 3.1 per cent compared to September 2017, and increased 36.4 per cent compared to October 2016. Find the October Statistics Package here. Federal Budget 2019 – What Today’s First-Time Buyers Need to Know! Homeowner? What You MUST Know About The Speculation Tax! Discover your next home in areas like Langley, Surrey or South Surrey. Or if you're seeking a more rural lifestyle, let us introduce you to Glen Valley, Salmon River and more!